When .Net compact framework came out, there was no migration path from eVB to .NET CF. eVBToDotNet forms helps you to move your projects. What is does is take away the pain of having to redesign the forms. 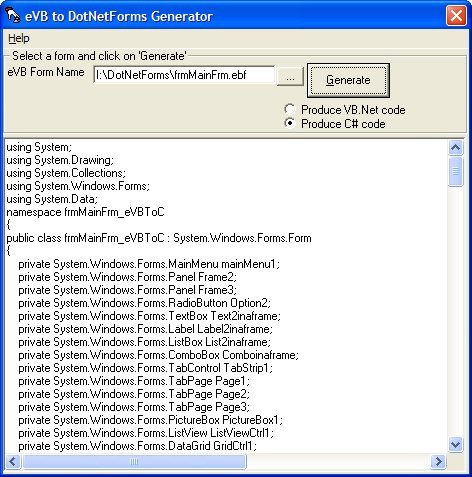 Simply run eVBToDotNetForms against your current eVB form, and it will generate .Net code to draw your form. It also gives you a choice of generating VB .Net or C#. eVBToDotNetForms does not migrate any code, it generates the code for the screen. 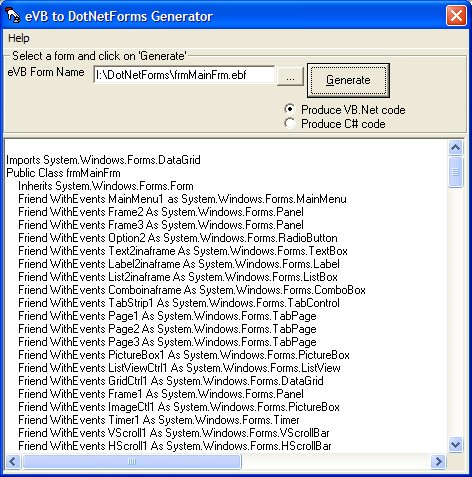 Simply choose your eVB form file, and click on ‘Generate’. The code is generate, and you can then copy and paste it into your .Net project. Below are 2 sample screens showing the results of output in VB.Net and C#. The program caters for form elements being ‘off screen’ and reproduces them. The controls are ‘translated’ to their equivalent, so that Frames become Panels. eVBToDotNetForms costs $29.99, and includes 1 year of support via e-mail, and all upgrades and any bug-fixes, and can be purchased by emailing sales@gui-innovations.com.